I2C Uses : I2C can be used to control a wide range of devices: analogue-to-digital and digital-to-analog converters (ADCs and DACs), LCD and OLED displays, keyboards, LED and motor drivers, memory chips and cards (EEPROM, RAM, FERAM, Flash), pressure and temperature sensors and other peripheral devices. I2C GPIO Extender – Microchip’s MCP23008(8channel), Microchip’s MCP23017(16channel), Texas Instruments pcf8574(8chennel). 1000 different IC’s manufactured are available 50 more companies. 7bit addressing mode have 128 address line and maximum 112 Slave node can be connect masters. Two address words are used for device addressing instead of one. The group number represents the hexadecimal equivalent of the four most significant bits of the slave address (A6-A3). This is a bidirectional pin used to transfer addresses and data into and out of the device. It is an open-drain terminal. Therefore, the SDA bus requires a pull-up resistor to VCC (typically 10k Ω for 100 kHz, 2 kΩ for 400 kHz). For normal data transfer, SDA is allowed to change only during SCL low. Changes during SCL high are reserved for indicating the Start and Stop conditions. This input clock is used to synchronize the data transfer to and from the device. The master generates all clock pulses, including the acknowledge clock pulse. The maximum number of nodes is limited by the address space, and by the total bus capacitance of 400 pF. Combined messages, where a master issues at least two reads and/or writes to one or more slaves. master-transmitter sends data to slave-receiver. master-receiver requires data from slave-transmitter. The minimum resistance is pretty easy to determine, and is based on the bus voltage (Vbus), the maximum voltage that can be read as a logic-low (VOL), and the maximum current that the pins can sink when at or below VOL (IOL). The maximum pull-up resistance is based on the needed rise-time of the clock (dependent on the I2C clock frequency), and the total capacitance on the bus. The I2C specification (http://cache.nxp.com/documents/user_manual/UM10204.pdf) lists the maximum total bus capacitance with a pull-up resistor to be 200 pF (it can be up to 400 pF if the pull-up is a current source, section 5.1). This specification also describes the rise-time of SDA/SCL to be a maximum of 300 ns in “Fast-mode” – 400 kHz. Where rt is the maximum allowed rise-time of the bus, and Cb is the total bus capacitance. Therefore, we can select any available resistor value between 966.667Ω and 1.77 kΩ. The value of the pullup resistor can be selected based on the trade-off for the power consumption and speed. Data transfer may be initiated only when the bus is not busy(Free). During data transfer, the data line must remain stable whenever the clock line is high. Changes in the data line while the clock line is high will be interpreted as a Start or Stop condition. An Acknowledge bit must follow each byte. A high-to-low transition of the SDA line while the clock (SCL) is high determines a Start condition. All commands must be preceded by a Start condition. low-to-high transition of the SDA line while the clock (SCL) is high determines a Stop condition. All operations must end with a Stop condition. Each data transfer is initiated with a Start condition and terminated with a Stop condition. The number of the data bytes transferred between the Start and Stop conditions is determined by the master device. Data is transferred with the Most Significant Bit (MSB) first. An Acknowledge bit must follow each byte. The last bit of the control byte defines the operation to be performed. When set to a ‘1’ a read operation is selected, and when set to a ‘0’ a write operation is selected. A device that acknowledges must pull down the SDA line during the Acknowledge clock pulse in such a way that the SDA line is stable-low during the high period of the Acknowledge-related clock pulse. The master generates all clock pulses, including the acknowledge clock pulse. If a slave is pulling the clock down, it’s called “clock-stretching” and is a signal to the master to pause until the slave is ready. What will happens if the two masters are write different data to same slave-1 in I2C? 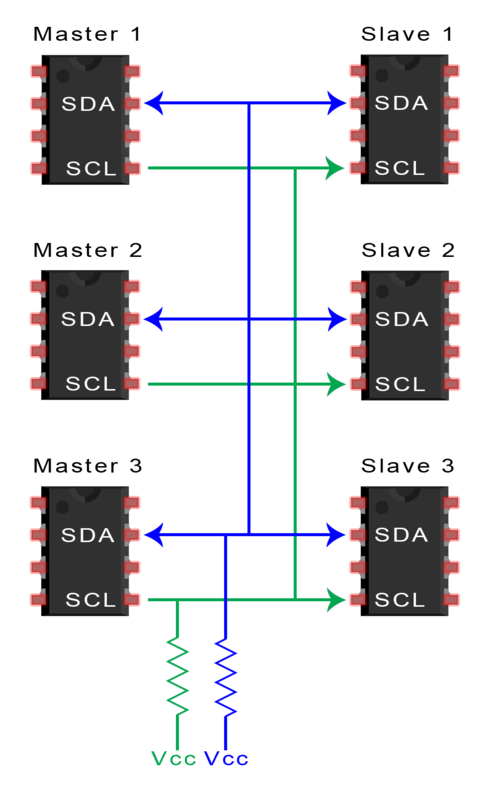 What will happens if the two masters are write same data to same slave-1 in I2c? What will happens if the two masters are read data from same slave-1 in I2c? Example 1 : LM75 temperature sensor in its easiest mode, the master sends the address and a read bit, and then reads two bytes back. Since the master sent the address, the slave acknowledges to say it’s ready. Then the slave sends a byte, which the master acknowledges with an ACK. Then the slave sends the second byte, to which the master responds with a NACK and a stop signal to say it’s done. Example 2 : Wrapping up the protocol, there’s also multi-part communications. If the master needs to send a byte to the slave, and then read some bytes back, for example, it needs to first send the address with a write signal and then re-send the address with the read signal. To signal the change of mode, the master sends the so-called “repeated start” signal, which is just a regular start signal when there’s been no preceding stop. Again, here’s an example with the LM75, first telling the LM75 that is wishes to read the high temperature setting, and then reading the two bytes back. Q : What is I2C ? Q : Who developed the i2c communication protocol? I2C is developed by Philips (Now NXP Semiconductor). Q : When the I2C communication protocol was developed? I2C is developed by Philips (Now NXP Semiconductor) at 1982. Q : I2C is half duplex or full duplex? I2C is Half Duplex. Because this I2C communication can’t able to master send data to slave or slave send data to master in same time. Q : I2C is Synchronous or Asynchronous Communication? Q: I2C is a Serial or Parallel communication? I2C is serial communication. required one data line for transmit all byte of data to the destination. Q : I2C is Edge Triggering or Level Triggering? Q : How many line required for I2C communication bus? Two lines required for I2C Communication. That are SCL and SDA. Q : What is mean by SDA line in I2C communication bus? Q : What is mean by SCL line in I2C communication bus? Q : Why required Pull up resistor connection for I2C? System Bus lines are SCL and SDA are designed by Open drain logic, So required pullup resistor for making SDA & SCL line as high/low. Q : Why you require two pull up resistor for SCL & SDA? : Answer will add soon. Q : Why not require one pull up resistor for i2c even SCL or SDA? : Answer will add soon. Q : How you select I2C Pull up resistor? Its Depends up on the Bus capacitance. Q : What are the i2c communication speed modes ? Slow mode, Standard mode, Fast mode, Fast plus mode, Ultra fast mode. Q : How to set i2c speed in Master device? Some device have default speed rate. most of the embedded micro-controllers support the standard mode(sm) 100kbs, fast mode(fm) 400kbs, fast mode plus (fm+) 1.2kbs, High speed mode(hs-mode) 3.4kbs. Q : How to set i2c speed in Slave device? Microchip MCP23008 supports 100kHz, 400kHz, 1.7MHz. Microchip MCP23017 supports 100kHz, 400kHz, 1.7MHz. Two different addressing modes are available for i2c communication. Q : How to set the address of the slave in I2C communication? Q : I2C Master can communicate in same bus with one 7bit address slave and another 10bit address slave ? 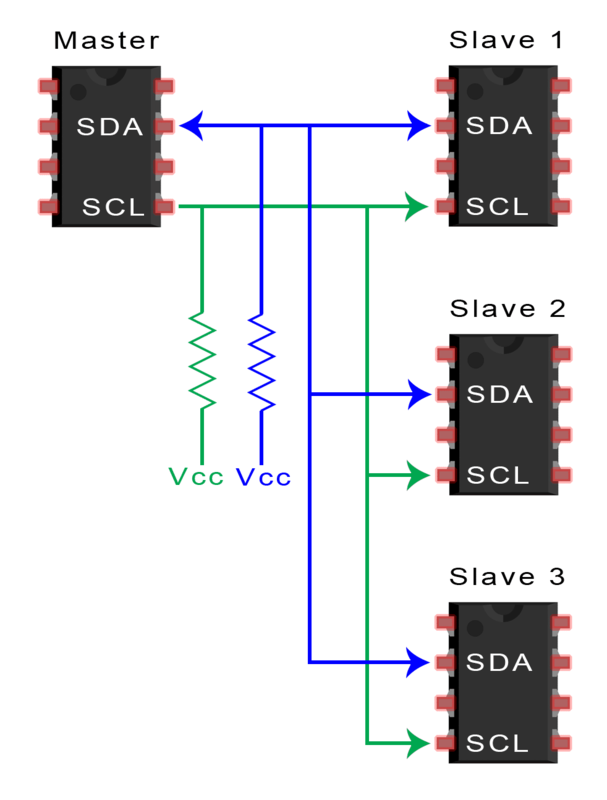 Q : Whats is Slew Rate in I2C? Q : What is transition time in I2C? Q : What is address collision in I2C? Q : Draw the I2C basic Connection Diagram? : Will Add Soon. Q : Draw the i2c data frame for 7 bit addressing mode? Q : Draw the i2c data frame for 10 bit addressing mode? Q : Draw the i2c start bit condition signal? Q : Draw the i2c stop bit communication signal? Q : Draw the i2c repeat start bit communication signal? Q : Draw the i2c acknowledgement bit communication signal? Q : Draw the i2c non-acknowledgement bit communication signal? 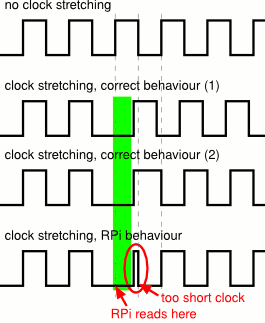 Q : What is I2C clock Stretching? Q : What is I2C clock synchronization? Q : Draw the I2C clock synchronization signal?Q : What is I2C Arbitration? Q : Maximum length of the I2C Cable can use? I was working up-to 3 meters RJ45 cable(LAN cable). Q : What are the limitations of I2C interface?